Much is rightly made of Greece's architectural heritage. When you've got the Parthenon in your back catalogue, you can justifiably feel a sense of pride. But - and there's always a but, isn't there? 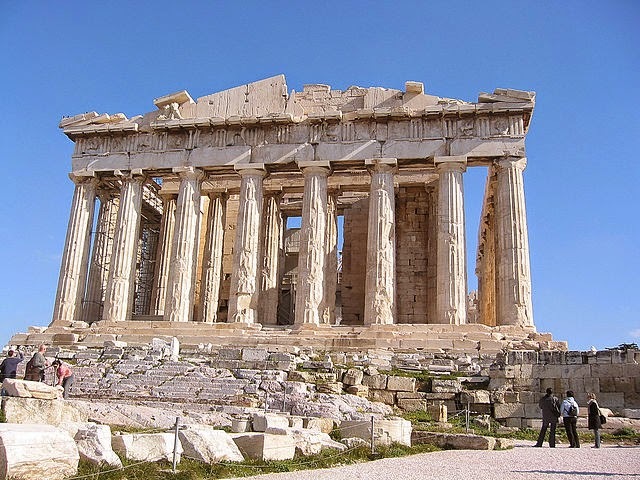 - surely something as splendid as the Parthenon should be the precursor to something even better. After all, we are centuries on from when the Parthenon first appeared on the Acropolis. Well, yes and no. I have no doubt that some wonderful buildings have gone up in Greece in the ensuing centuries, but there have also been some complete and utter clunkers. For example, exhibit A pictured below. The concrete framework in the picture has graced the seafront of Skopelos town for a number of years. It's horrid, isn't it? To be honest, it's been there so long I don't even notice it any more. Viewed from some angles all you do is see through it so that your view of the building is a sort of framed version of whatever is behind it. I have been told that the building was destined to be the new home for the Skopelos branch of the National Bank of Greece combined with new police headquarters. That seems quite possible as the two bodies, bank and police, currently share a home elsewhere in the town. No doubt the crisis, always the crisis, put paid to the plans and it is quite possible it was thought better to drop the scheme mid-project rather than spend any more money on it. Whether it will ever reach fruition is anyone's guess, but pretty it ain't. And if you were looking at the picture above and thinking, "Well, I don't it know, it's not that bad", here's a picture of the Parthenon. Crumbly as it is, even a combined bank and police station would look pretty glorious in that, you'd have to agree. The Parthenon. For full attribution see below. For my musical sign-off I started thinking about police and banks and somehow this came to mind. Strange, but true... If you work in a bank, please don't take it personally. Ooh, you are offal, but I like you!